Through brutally challenging practices and selflessness, these two teams created a strong bond and lifted the UW football program to national prominence, marked by two huge wins against Big Ten opponents. Sixty years ago, West Coast football was viewed as soft. The Big Ten dominated the Rose Bowl. Chris Petersen has returned UW to national glory, bringing the program the respect it had during coach Don James’ long and successful reign. But it was in 1959 and 1960 when the Huskies first achieved national acclaim. They were the darlings of the city. And why not? The gritty, undersized Huskies won with superior toughness and discipline, borne from brutal practices under coach Jim Owens that made many quit. Those who remained banded together, forging a combat-like camaraderie. They delivered one of the best two-season stretches in program history, going 20-2 with two Rose Bowl wins and a national title after the 1960 season according to one poll. 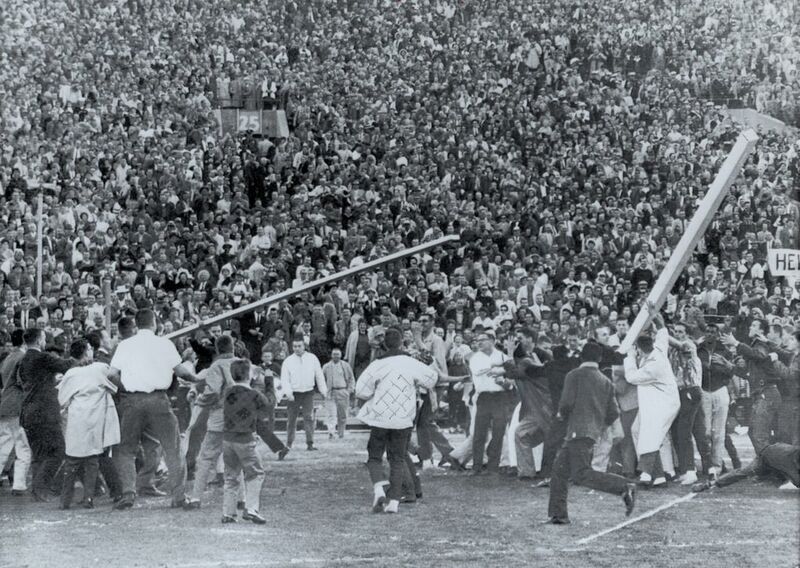 The 44-8 win over favored Wisconsin in the 1960 Rose Bowl is arguably the greatest win in program history. If not, the 17-7 win over No. 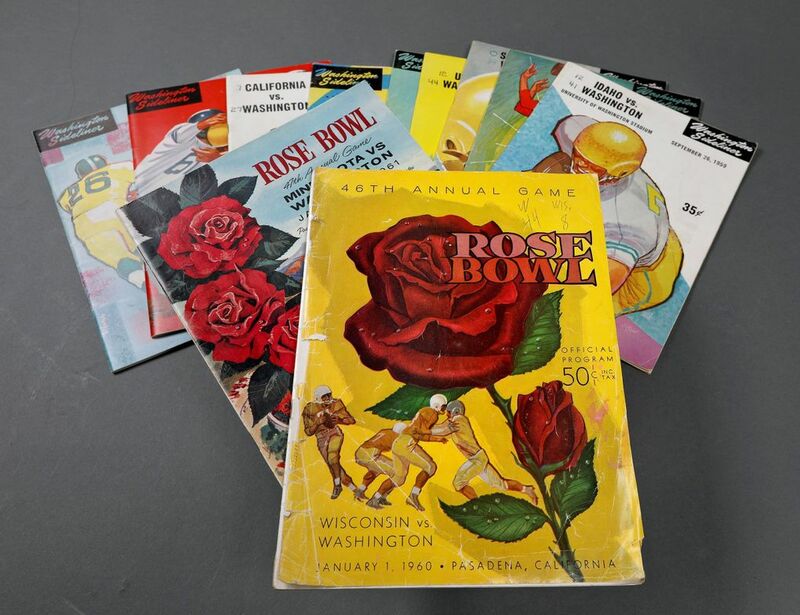 1 Minnesota in the 1961 Rose Bowl is in the conversation. Many of the players went on to more success, including pro football, business and politics. The discipline and toughness that Owens demanded served them well later in life. We recently caught up with several of them. Here is their story. Actually, several players went to the hospital because of severe cramping. That practice, in Owens’ first year as coach, became symbolic. It was a different time, and the training methods Owens employed would not be condoned today. Players were not allowed to drink water at practices, and sometimes were pushed until they collapsed. Coaches got physical with players. It was just how it was. Owens was 29 when he was hired before the 1957 season. An All-American end at Oklahoma, he had been an assistant coach at Texas A&M under Bear Bryant, who went on to greater fame at Alabama. Owens was on Bryant’s staff during the team’s brutal 10 days of all-day training in Junction, Texas, in 1954. The survivors, immortalized as the Junction Boys, became the subject of a book and movie. Owens was determined to instill that toughness at UW. While Owens was tough, assistant Tom Tipps was tougher. He would yell at his players “it’s 90 percent mental and 10 percent physical” during the hardest of drills. Part of being tough was tackling with their helmets. Those who didn’t were derided. Tackling headfirst was considered the surest method to bring down a player, and it inflicted the most pain for opponents. 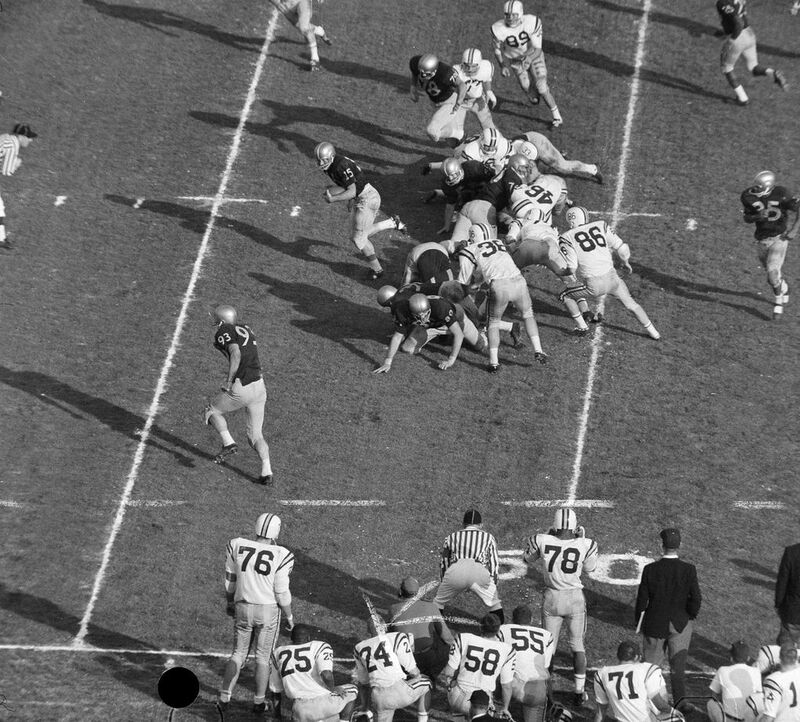 Those who survived the brutal practices eventually thrived, in part because superior conditioning gave the Huskies an edge in the fourth quarter, with UW pulling out several close victories in 1959 and 1960. “Developing this team was like developing a combat unit, maybe a Marine combat unit,” Owens told The Seattle Times before the 1961 Rose Bowl. Don McKeta, an all-West Coast running back and defensive back, was older than his teammates, having spent four years in the Navy. He was voted the team’s most inspirational player in 1959 and 1960. The intense workouts created camaraderie. During two-a-day practices, the team stayed together at the UW shellhouse, sleeping on army cots on the porch. Many players had never been outside Washington. McKeta, who had traveled the world in the Navy, told his teammates stories under the stars. “I would tell them about the experiences I had, and they would sit there and look at me with their eyes wide open,” McKeta said. Early in practice, reserves could challenge the starters and take their spots by winning one-on-one blocking and tackling competitions. Even that didn’t create friction. There wasn’t friction between the offense and defensive units, because players played both offense and defense, even the quarterbacks. Schloredt, in addition to being a QB and defensive back, was also one of the nation’s top punters. Halfback George Fleming was one of the country’s best kickers. Team came before individual. Carries were split up between several running backs, so no player had really big numbers. Players’ names were not on their jerseys. Credit was always extended to teammates. In 1959, after UW earned its first Rose Bowl berth, McKeta praised the line. After all these years, he’s saying the same thing. Outsiders weren’t expecting much from the Huskies, coming off a 3-7 record, their second straight three-win season under Owens. But many of the 1958 losses were close games, including a 12-7 loss at No. 3 Ohio State when the Buckeyes scored a late touchdown. It took another year for it to show on the scoreboard. Schloredt was one of 14 sophomores who lettered on the 1958 team and would become key players the next two seasons. Another was Bob Hivner, who began the 1959 season as the starting quarterback. But in the season-opening 21-12 win over Colorado, Hivner suffered a broken finger on his throwing hand. Enter Schloredt, a talented athlete from Gresham, Ore. He was legally blind in his left eye, the result of a childhood fireworks accident. Schloredt helped keep things rolling, and UW was 4-0 entering its game against No. 6 USC, a two-touchdown favorite. USC rallied to win 22-15, but McKeta said it was a turning point. They realized that potential, winning 13-12 the next week at No. 11 Oregon, then winning the next four games, including consecutive 20-0 shutouts of California and Washington State. The win over WSU gave the Huskies their first Rose Bowl berth since 1944. Awaiting them was No. 6 Wisconsin, a 6 1/2-point favorite. The Big Ten had won 12 of the previous 13 Rose Bowls, and the Badgers had a distinct advantage in size. The Huskies, who trained hard for two weeks in Long Beach, Calif., far enough from distractions in Pasadena, had an advantage in speed. And in hunger. Norm Dicks was on the freshman team in 1959 and had to pay his own way to the game, taking his first flight ever. What he saw was a demolition. The Huskies took a 17-0 lead in the first quarter, scoring on the final play of the period on a 53-yard punt return by George Fleming, who also made a 36-yard field goal and five extra points. In the second quarter, Wisconsin closed the gap to 17-8. But UW’s Lee Folkins, a 6-foot-5 end from Roosevelt High School, used every inch of his tall frame to snag a pass from Schloredt in the end zone. It’s still considered one of the finest catches in Rose Bowl history. That made it 24-8. Wisconsin was finished. Schloredt had a combined 188 yards rushing and passing and was named co-MVP with Fleming after Washington’s 44-8 win, still the-most lopsided Rose Bowl since 1948. “That was the greatest game, I think, in Husky history,” Dicks said recently. For McKeta, it was a letdown. The Huskies might have surprised teams in 1959, but they were a target in 1960. Schloredt was on the cover of Sports Illustrated the week before the Huskies hosted No. 17 Navy, but the Midshipmen kicked a field goal in the final seconds to win 15-14. The Huskies did not lose again, becoming known as the Cardiac Kids for their close victories. In one three-game stretch in midseason against UCLA, Oregon and Oregon State, they won by a combined four points. Against Oregon State, they rallied from two touchdowns down late in the third quarter to win by a point. 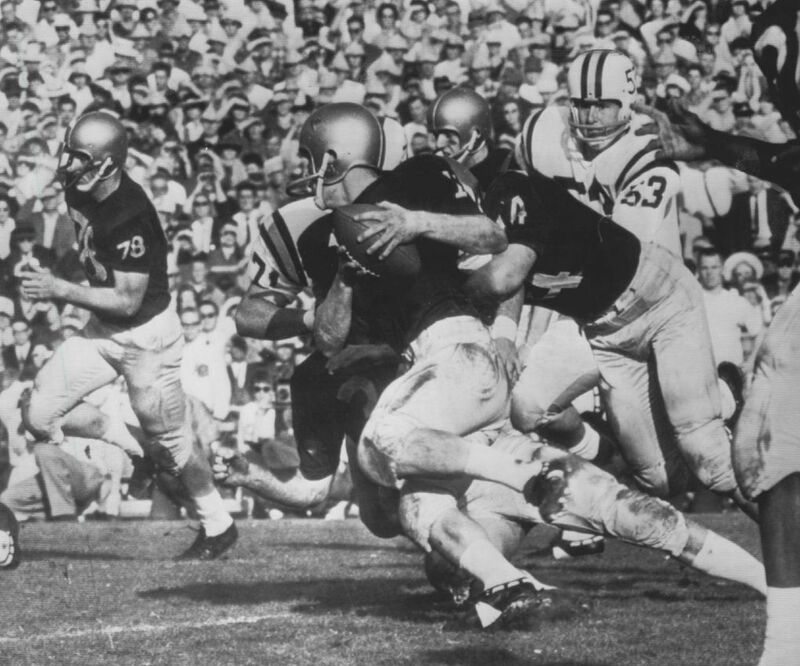 With the exception of Hivner’s injury, the Huskies had enjoyed good health in 1959. That was not the case in 1960. Schloredt suffered a broken collar bone in the fifth game and did not return until the Rose Bowl. Hivner regained the starting job, leading the Huskies to win after crucial win. With the exception of All-American center Roy McKasson, the entire starting offensive line – guards Kinnune and Chuck Allen, tackles Barry Bullard and Kurt Gegner and tight end John Meyers — suffered serious injuries. Sophomores Ray Mansfield and Rod Scheyer were forced into action. It meant bigger roles for seniors Stan Chapple, Ben Davidson, Jim Skaggs and Dave Enlow. And the guys who were hurt tried to tough it out. The regular-season finale against Washington State was taut and suspenseful. Washington State took a 7-0 lead early in the fourth quarter. The Huskies then got a spark from McKeta, who in the second quarter had his leg gashed by a cleat. He had 10 stitches, got it wrapped up and played the whole second half. McKeta rushed for 56 yards in the second half, then after UW scored a touchdown, he caught a pass from Hivner for the winning two-point conversion. The Cougars had a last-second field goal attempt, but Jackson blocked the kick. It was McKeta’s return from injury that struck Dicks. The Huskies were heading back to the Rose Bowl. The Huskies’ opponent was top-ranked Minnesota, the national champion in most polls, with the final votes in those days coming before bowl games. Like the Badgers a year earlier, the Gophers were a bigger team, and a touchdown favorite. The 5½ weeks between games allowed many of the injured players to get healthy, and the Huskies were ready. Washington led 17-0 at halftime. Fleming kicked a 44-yard field goal, the longest in the game’s history at the time, and Schloredt threw one touchdown pass and ran for another. The Huskies unveiled a new defense, with five defensive linemen. Enslow, nicknamed the Bear, played in the middle. “They couldn’t run inside on us,” Enslow said. UW won comfortably. Schloredt was MVP again. Perhaps as big of a star was fullback and linebacker Ray Jackson. He played almost every snap as fellow linebacker and fullback Joe Jones had suffered an appendicitis two weeks before the game. The two polls that waited until after the bowls to vote were split. The Football Writers Association of America picked Mississippi. The Helms Foundation chose UW. In 2007, Washington had a ceremony recognizing that team as national champs. 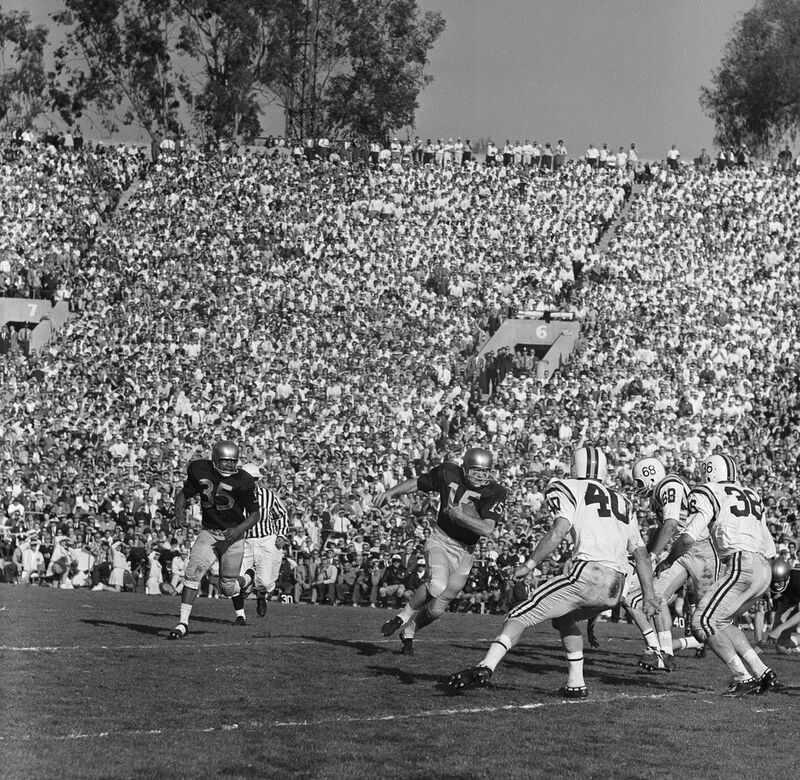 While the Huskies were unable to continue the level of success (reaching the Rose Bowl once in the next 17 years), the players on the 1959 and 1960 teams continued to excel. Many played professionally, some becoming stars. They became legislators, coaches, teachers, businessmen and one became a military hero. Owens retired from UW after the 1974 season, making it to just one more Rose Bowl, a loss to Illinois after the 1963 season. He died in 2009 at 82. Mansfield, from Kennewick, was a sophomore in 1960 and he went on to have the longest professional career of anyone from that Husky team, playing 14 seasons. He still holds the Pittsburgh Steelers record for most consecutive games played with 182 and was part of two Super Bowl winning teams. Stan Chapple, T: Long career in real estate, lives in Sequim. Dave Enslow, T: Longtime high school teacher and coach. Lives in Lynnwood, and has Husky football season tickets. Lee Folkins, TE: The Roosevelt High grad had a 5-year career in NFL. Survived a 66,000 volt shock in 1972 to have a long career in construction and engineering. Ray Jackson, FB: Was UW’s second assistant black coach in 1971 1971 before a long career as the budget director for Puget Power. Died in March this year. Jake Kupp, G: Did not letter for UW in 1960 as a sophomore, but played 12 seasons in the NFL. Grandfather of Cooper Kupp, former Eastern Washington star and current Los Angeles Rams WR. Roy McKasson, C: The 205-pound unanimous All-American played a year in the Canadian Football League before becoming a leader in the Young Life ministry in Dallas and Chicago. He died in 1998. John Meyers, T: After six years in the NFL, he came back to Seattle area, becoming president of the UW Tyee Board. Died in 1998. Jim Skaggs, G: Played 10 years for the Philadelphia Eagles as one of the league’s best guards, before a long career with State Farm Insurance. He became a successful insurance agent before dying at age 55 in 1996 while hiking in the Grand Canyon. “He was a guy that everyone rallied around,” Chuck Noll, his former Steelers coach told reporters after Mansfield’s death. Ben Davidson became one of the most feared defensive ends in pro football as an Oakland Raider before gaining more fame as an actor. He was on Miller Lite commercials and had appearances on several TV shows, including “M*A*S*H” and “Happy Days.” He died from prostate cancer in 2012. Chuck Allen, from Cle Elum, played 12 seasons in the AFL and NFL. He intercepted 21 passes with the San Diego Chargers and was inducted into the team’s Hall of Fame in 1984. 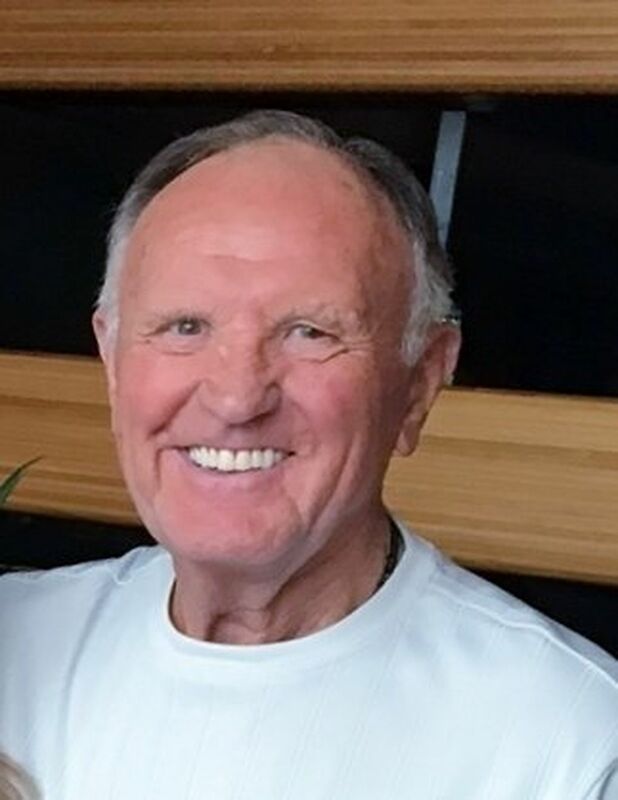 Allen joined the expansion Seahawks in 1975 as the director of player personnel, and spent 20 years with the franchise. He died in 2016. Norm Dicks didn’t letter in 1960 but intercepted a pass on his first play in the team’s 34-0 win over USC. He led the team in tackles the next two seasons before going into politics. He served 18 terms as a U.S. representative for Washington’s 6th congressional district, starting in 1977. Fleming had a brief career as a professional kicker (he once held the AFL record with a 54-yard field goal and the Canadian Football League record with 55-yarder), then also got into politics. He spent two years a Washington state representative, then became the state’s first black Washington senator, staying in that role for 20 years. Schloredt, after two seasons in the Canadian Football League, was an assistant coach for Owens at UW for 12 years before working with Housing and Urban Development. He lives in Enumclaw and attends many UW football games. “I think we’ve got a helluva coach,” he said of Petersen. 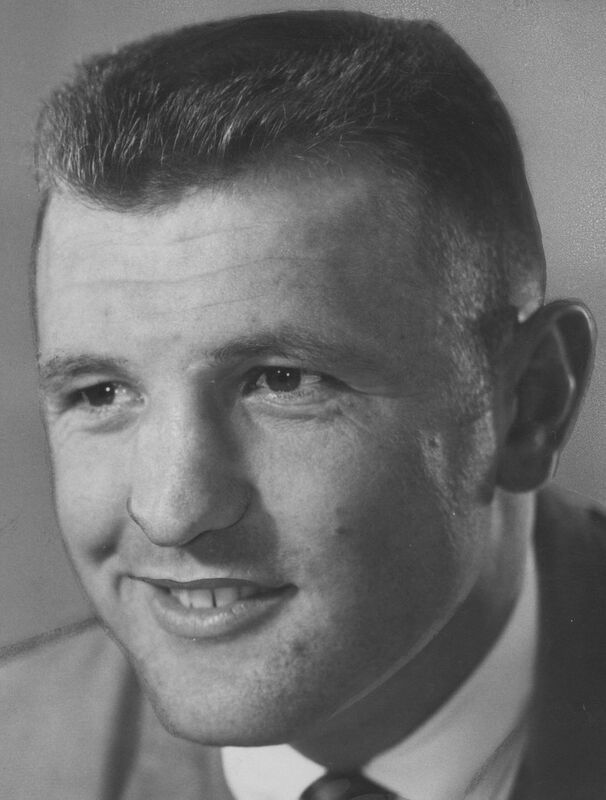 Charlie Mitchell led the team in rushing in 1960 as a sophomore. The Garfield High graduate played six seasons in the NFL before becoming president of Seattle Central Community College and chancellor of the Seattle Community College System. Carver Gayton, a senior on the 1959 team, became UW’s first black full-time assistant coach in 1968, then had a long career as an academic administrator, corporate executive and museum chief executive. Many became businessmen, with Kinnune perhaps the most successful. He needed cartilage surgery on both knees after the 1960 season, so he decided against pro football and began a career in business, rising to executive vice president with Willamette Industries. Tipps, the tough assistant coach, had a heart attack in 1987. He was in the hospital and not doing well, and Kinnune gave him a call. McKeta, who lives in Sequim, remains the leader, helping keep players in touch. He played briefly in the CFL and was an assistant coach for two years at UW before a career in corporate sales. Tackle Barry Bullard, one of eight All-American Scholar Athletes as a senior, and guard Larry Clanton went into the Air Force. Clanton, a pilot, died in combat in the Vietnam War in 1968 and was awarded the Silver Star. Bullard served 16 years and earned a bronze star during the Vietnam War. After retiring as a major, he tutored middle-school students. He died in 2012. 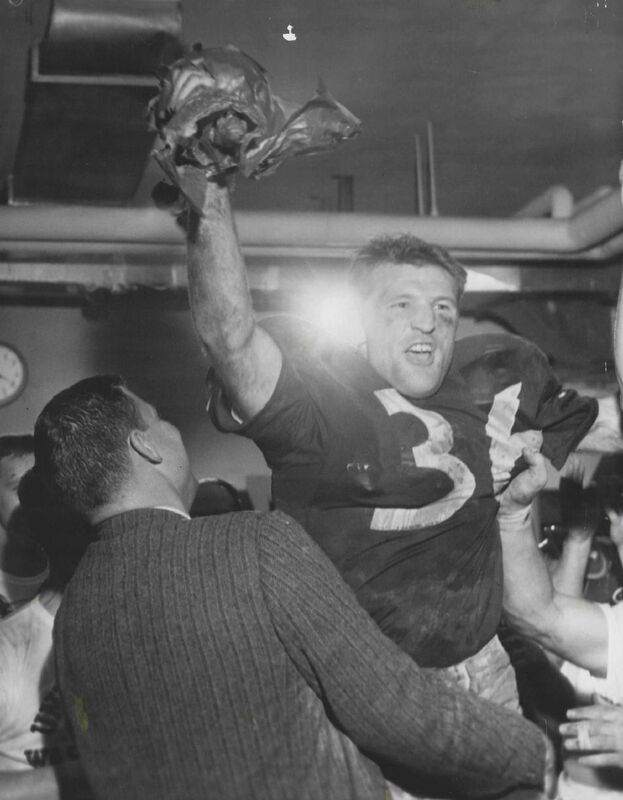 Players from the 1959 and 1960 UW teams were used to making a difference.